← Another Good Story Ruined: Vintage Eateries in L.A. Originally a dream of Los Angeles benefactor and convicted murderer “Colonel” Griffith J. Griffith, Griffith Observatory now stands as one of the city’s preeminent and most beautiful structures. Looming high over Franklin Avenue and visible for miles, the magnificent building stands as one of Los Angeles’ Art Deco jewels. Still radiant after 80 years, the Griffith Observatory stands as a monument to ingenuity and ambition, urging residents to look up to the skies. Griffith, a wealthy mining speculator, donated 3,015 acres of the old Rancho Los Feliz to the city of Los Angeles in 1896 for use as a public park. In 1903, however, residents turned against him after he shot his wife in the face during a drunken rage. Inspired by a look through Mount Wilson’s enormous telescope in 1912, Griffith offered Los Angeles $100,000 to construct a similar observatory on Mount Hollywood. 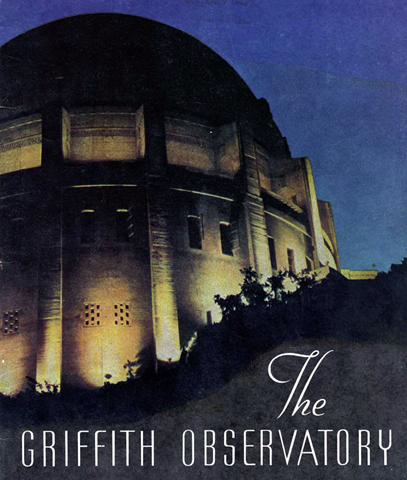 After years of settling Griffith’s estate and probating the will, a $750,000 trust was established in early 1930 at Security-First National Bank for the construction of a world renowned Observatory. Trust officials traveled across the country viewing fellow planetariums before deciding on how to proceed. In early 1931, they suggested an innovative $75,000 Zeiss planetarium, to be constructed at Zeiss Works in Jena, Germany, as one of the main features of the planned hall of science, as well as a twelve-inch refracting telescope. The Parks Commission voted approval for the purchase on February 9. The Parks Commission hired renowned architects John C. Austin and Frederick Ashley on May 14, 1931 to design the proposed Observatory, with preliminary plans submitted October 7. After wrangling over where to construct Griffith’s hall of science in the park, a location west of the Greek Amphitheatre was selected, due to ease of constructing roads to reach the site. After the Parks Commission approved preliminary sketches of a modern Greek design in granite in January, the February 14, 1932 Los Angeles Times reported that construction would start in early April, with expected costs of $600,000 and take seven months to complete. 100 men would build the reinforced concrete building, rendering it fireproof, built around a steel frame and sections. The Park Board officially approved naming the building Griffith Observatory on February 24. Architects Austin and Ashley announced plans to obtain all construction materials near the vicinity of Los Angeles in order to aid local businesses. In the same vein, unemployed workers in the area would be hired to construct the building. Materials such as terra cotta, stone, plaster, ornamental iron and bronze, marble, cement, and structural steel would all be fabricated here in Los Angeles. Construction of the Zeiss planetarium took much longer than expected, pushing groundbreaking until June 20, 1933. Federal, county, and city officials heard Mayor Porter, Mabel V. Socha, President of the Parks Commission, and scientists speak on the importance of building a world class structure to inform Los Angeles residents about the power and wonders of science. Officials announced that 250 men working seven days a week would complete the building by January 1, 1934 under the supervision of the Simpson Construction Company. Construction plans changed in August 1933, however, after the City Council approved stricter building codes in reaction to the 1932 Long Beach earthquake, slowing down the process. Reinforced monolithic concrete from the Portland Cement Association was employed to create a building with a resistance to lateral forces equivalent to 10 percent of gravity. Albert J. Kopec’s photograph of Griffith Observatory under construction, courtesy of Mary Mallory. That same month, the enormous Zeiss planetarium arrived by steamer from Germany, the third of its kind in the United States, which the August 21 edition of the Times called a “master projector” and “a school, a theater, and a cinema in one.” The Berkeley Daily Gazette stated it would create a synthetic “vault of heaven” on the interior of the Observatory’s smooth white dome, displaying a starry night sky. Officials joined the waning Public Works of Art Project, noting they would hire local artists to design and create elaborate and elegant decorations to adorn the facility. 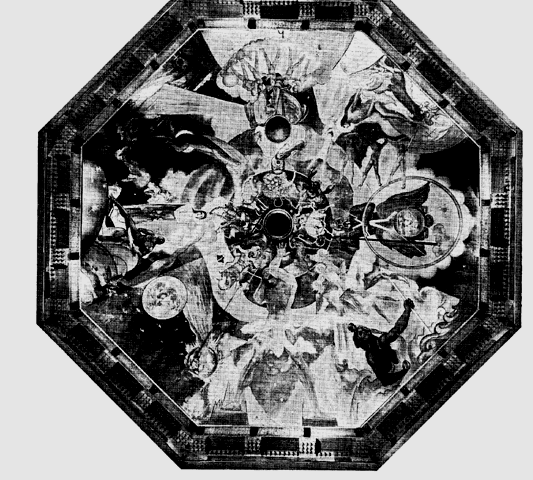 Architect Austin solicited mural sketches from five artists on March 6, 1934, with six asked to give 15 minute presentations discussing the scientists and history designed for their panels: Samuel Armstrong, Lucille Lloyd, George Bandriff, Millard Sheets, Einar Petersen, and Hugo Ballin. The Commission selected Ballin on April 16 to create eight panels 11×16 feet in size telling the history of science and discovery as well as decorate the lobby’s ceiling, with a fee of $8,000 if the work was completed in six months. Ballin completed his eight panels around work creating murals for the Los Angeles Times building and Title Guarantee Building, turning in eight rolled panels to the trustees of the City Park Commission on October 2. Upon completion of painting and design work by the Anthony Heinsbergen Company, the murals would be hung. The Municipal Art Commission held up paying Ballin at the end of the month however, claiming his signature was too large on the panels. The artist finally received payment in January 1935. One of the Hugo Ballin murals at Griffith Observatory. The City Parks Commission approved sculptor Archibald Garner’s design for an elaborate obelisk 40 feet tall to stand in front of the Observatory on March 12, 1934, with the Women’s Community Service Auxiliary furnishing materials and the Federal Government supplying labor to complete the monument. Sculptors Roger Noble Burnham, Djey el Djey, Gordon Newell, and Arnold Foerster were hired to help Garner complete the massive work, featuring the stylized likenesses of Hipparchus, Copernicus, Galileo, Kepler, Newton, and Herschel. Foerster devised the engineering required in pouring the huge concrete shaft, around which the sculpted figures stood. Each was first modeled in clay before being molded in plastic and then finished in concrete. The Astronomers Monument was dedicated November 25, 1934 after the previous attempt the week before was rained out. Critic Anthony Miller in the Los Angeles Times called it “sincere artistry,” but thought something lower to the ground was better suited than an an obelisk surrounded by short and slender bodies, and festooned with a “doodad” (astrolabe) on top. One of Hugo Ballin’s paintings for rotunda of Griffith Observatory. Installation of the inner plaster dome after completion of its outer copper shell over a steel and concrete frame delayed construction. Cal Tech professor Dr. Edward Kurth’s death in an automobile accident in April 1934 also delayed design and completion of the scientific exhibits to be displayed in alcoves off the long hallways spanning the building. A giant of Foucault’s Pendulum was installed in the center of the main foyer to demonstrate the earth’s rotation on its axis. Simpson Construction Company completed the building on October 2, giving way to finishing of the interior by the Heinsbergen Company before Ballin painted the decorative ceiling in the foyer depicting the universe through Greek mythology. It cost $300,000 to construct the building, with an additional $15,000 for the twelve-inch telescope and $75,000 for the Zeiss planetarium. Walls, columns, pilasters, and wainscoting were composed of Italian Travertine marble,with the foyer floors marble tile. The planetarium floor was finished in cork tile to reduce sound. Laborers rushed to finish landscaping and construction of a retaining wall, with gates erected to prevent looky-loos from disturbing their work. 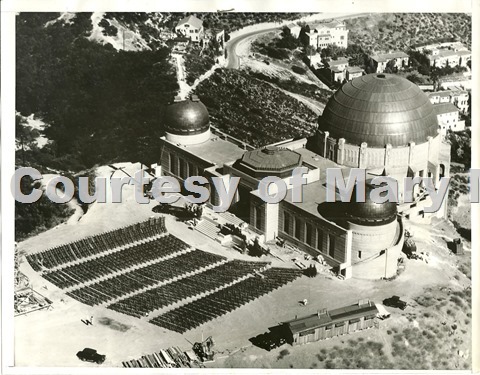 At 8:30 pm May 14, 1935, grand opening ceremonies for the gorgeous Griffith Observatory commenced. Invited guests saw Bruce H. Grigsby, Vice President of Security-First National Bank present the Observatory to the City, accepted gratefully by Mayor Shaw, entrusting it on behalf of the city to the Parks Commission. The Times noted that the building “satisfies both the artistic and scientific aspirations of the builders of a new Athens on the shores of the Pacific.” The next day it opened free to the public daily from 10 am to 10 pm, with a charge of twenty five cents for lectures and demonstrations. Los Angeles residents flocked to see the new Observatory, with 18,000 seeing it the first week, and almost 50,000 people visiting in the second half of June. Visitors continue their pilgrimages to the magnificent and romantic shrine, drawn to both its outstanding architecture and its superlative views. Photographers and filmmakers feature it as well, drawn to its futuristic design. The Gene Autry serial, “The Phantom Empire,” was the first to employ Griffith Observatory as a filming location, followed by the avant-garde short, “House of Cards” in 1947. James Dean’s “The Rebel Without a Cause” also employed the planetarium to shoot scenes. This entry was posted in Film, Hollywood, Hollywood Heights, Mary Mallory, Parks and tagged Griffith Observatory, Griffith Park, hollywood, Hollywood Heights, Mary Mallory. Bookmark the permalink. Minor point: the Long Beach Earthquake was in March 1933. Correction: Griffith J. Griffith wounded his wife in an attempt to murder her, but she survived the attack.